Blake and I got a gift certificate to one of our favorite dinner spots in Lexington this year for Christmas!! We were so grateful for this gift because date nights have been few and far between since we moved into our new house... Though, we would eagerly look for any excuse to go to this local bar!! I don't want to insult them by calling them a "dive bar" because the facility itself is quite clean, and the food is top-notch, but in most other ways, that's what it is [LOL]. None of the plates or glasses match, none of the tables or chairs match, all of the decor looks like it was donated to them, and all of the board games [that I LOVE to play] have definitely been previously loved. It's also a little dark in there, which is fun!! But like I said before, the food is EXCELLENT for a bar, and at a surprisingly good price for the quality!! To top it all off, they have a very good beer selection, according to my hubby. All of those attributes come together to just make a really great atmosphere! I love going there, and while I'm there, I love being there!! Navigate through the pics to see our night! This is the view from Lexington Main St. This is the view when you walk into the restaurant. 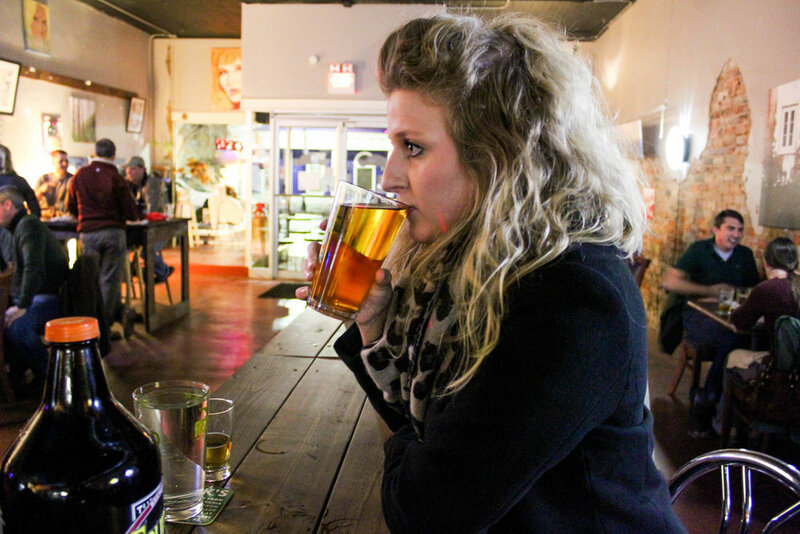 This is me drinking the Bold Rock Apple Cider (I don't drink beer). I typically get the Shrum Panini (mushrooms, goat cheese, basil-mayo, and focaccia on crunchy bread - AMAZING). But I decided to branch out this time! The sandwich you see in the picture slideshow above is the Caprese Sammy - complete with house pulled mozzarella, sliced tomato, basil-mayo, and fig vincotto on crusty bread. It was SO GOOD! My side was the soup of the day, which was Tomato and Squash soup, and by 7:30 they had sold out [they literally wrote "86" on the chalkboard menu over the soup description - they 86-ed it... I loved it!]. Another item at the top of our typical order list is the Cheese Board, but we didn't get it last night because we find it hard to finish with just 2 people, but when we come with family, we always order it!! I HIGHLY recommend it. Y'all, by 8:00, it was standing room only! So get there early, at least on a Friday night! I really hope you locals give this place a try! If any non-Lexingtonites come into town, and you want to eat at one of those restaurants one of the locals would suggest.... This is one of those! !